The Burton Women’s Day Trader Snowboard is a directional tapered board with a flat to rocker profile that gives you great float in powder and is pretty easy to turn in deep snow and groomers alike. The Burton Day Trader is a free-ride snowboard that borders on the all-mountain line so when you are riding it doesn’t feel super aggressive like some free-ride boards tend to do. The Day Trader was a little difficult to make short radius closed turns through bumpy terrain or trees that you wanted to take speed off fast. It feels great a fast speeds, and it loves to make open medium to large radius turns and just cruise anywhere you want to take it. Approximate Weight: I thought it felt a little heavy, and Dallas thought it felt a little light. I think it is an average weight. It felt heavier to me because I usually ride boards a little smaller and this was a 150. Flex/Buttering: The Day Trader has a medium stiff flex that keeps the board feeling forgiving but it is stiff enough to keep it stable when you take it up to speed, and feel stable off of jumps and drops. Buttering was doable but not very easy. On Snow Feel: The Day Trader has a slightly loose feel on snow that is playful feeling for a directional freeride board which but solid enough to make you feel good when you want to step it up a little. Edge Hold: The edge hold felt good on medium to hard snow, I encountered a surprise patch of ice while riding and the edges held ok but it slid a little more than I wanted it to. It would be ok but not ideal for a day that has a lot of ice. Turn Initiation: Turning is medium to fast, for being a bigger board than I normally ride it turned well, but I felt like I could feel the flat under the feet when I was on groomers so it took a little longer to get on edge. Powder turn initiation was fast and easy though. Turning Experience: The medium to large radius turns were fun and easy to make. The Day Trader likes to charge open turns down the mountain. Small radius closed turns were a little slower and challenging to make. Carving: It can make good turns at speed and feel stable, it wasn’t my favorite for getting over onto a high edge angle, the Day Trader felt more at home making skidded turns rather than carve turns but it did ok. Speed: Feels great at higher speeds, it is nice and stable. I didn’t get chatter from the nose at all. Uneven Terrain: Bumpy snow was fine to get through as long as you keep the nose in the fall line and kind of power through, but trying to turn tightly and take speed off was a bit challenging. Powder: Felt great in powder, you are able to turn it well through trees as long as you are ok with taking them at speed, open powder turns were really fun, and drops into fresh snow felt great too. Switch: Riding switch was much easier than I thought it would be. You can feel the tail is short but it still has a little rocker in the tail to keep it from feeling catchy when you are riding switch. Jumps: Jumps were fun on the Day Trader, it has good pop and a nice stable feel on take-offs and landings. Jibbing: Didn’t try it on any jibs, but it wouldn’t make an easy jibber board. Pipe: Might be fun making slashy turns on the walls, we didn’t have a pipe at the time though so I wasn’t able to try it out. 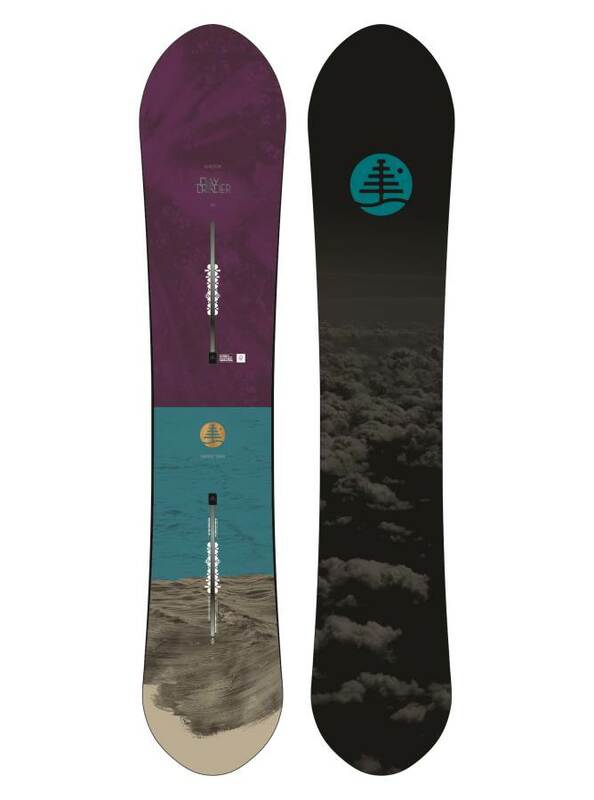 The Burton Day Trader offers up a slightly tapered flat to rocker ride that’s fun for those that want a slashy/surfy setback powder ride that can also be pretty fun on groomers for what it is. It’s not terrible to throw it around switch either. These days it sits in between the Stick Shift and Story Board in terms of overall ride. It doesn’t have the float of the Stick Shift but is close and ride groomers a little better. The Sory Board out turns this and really outshines the Day Trader on groomers but doesn’t float quite as easy and it’s less forgiving. It’s been a while since we have been on this but the boards overall design is still very similar to when we rode this so the older review still stands. It’s not standing upright but it still stands. Conditions: Pretty good Sierra Snow one day and pretty hard CO the other. Approximate Weight: Felt on the lighter side of normal. Flex/Buttering: right there in terms of the medium side of things. It’s flat top profile allows a little room for easy buttering. On Snow Feel: The Burton Day Trader is kind of in between flat to rocker and continuous rocker making it a mostly stable ride but in the harder snow, it can feel a little looser between the feet than you would expect. It’s a very forgiving easy ride that can work with all ability levels. Edge Hold: Not really there when the snow gets med/hard to hard. Up till that point, the Burton Day Trader is not bad but after that point, it lets go way too easy and it can be a bit scary. 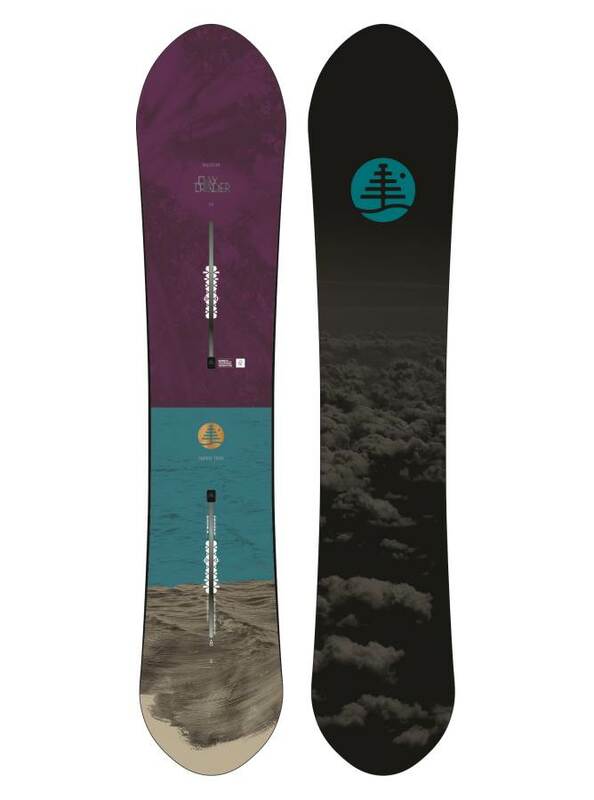 Powder: We never got this in powder but it has a flat to rocker profile that they call Directional Flat Top, a good bit of taper so the tail sinks and a set back on board as well as on sidecut so it should float pretty well. Based on our experience with similar Burton boards it should be pretty good here. Turn Initiation: Pretty fast edge to edge and an easy turner. Skidded Turns: Very easy to skid turns and not a hard board to ride if you aren’t always on point with your turning. You can skid turns pretty easy all day if you need to. Carving: The Day Trader is not going to be a carving board. Flat Top tech can be a bit washy and it doesn’t hold on a real carve. You get more stability between the feet than Flying V but it’s just not going to hold a carve like the Directional Camber options out there in 2019 like the Burton Story Board. Speed: Pretty stable at speeds and not too chattery. The base is really fast so it keeps its speed in the flats. Uneven Terrain: It’s so small size combined with Burton’s shock absorbent flex makes for a very easy board to negotiate moguls you might find on the way to a powder stash. Switch: Pretty doable for how setback it is and it can be done no problem if you need to here and there. Jumps: Pops pretty well off the tail for the camber profile it has but it doesn’t compete with the Directional Camber boards when it comes to hard pop off the tail. Conversely, this is easier to make it pop for an ollie though. Pipe: As long as the pipe wall is soft the Burton Day Trader could work well. We try to get as many images of the Burton Day Trader, but forgive us if they're not all there.